Fresh basil leaves, I used around 5 tiny ones from the plant I have on my windowsill. 2 tomatoes, look for vibrantly red ones, or ones on the vine. 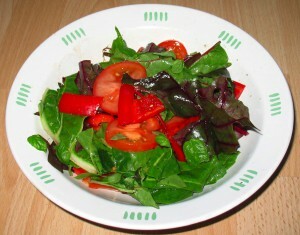 Wash the salad leaves, basil, tomatoes and pepper. Rip the lettuce into more bite sized chunks, and tear the basil. Thinly slice the tomatoes, and dice the red pepper. Add the veg to a large bowl. Then add the vinegar, lemon and olive oil, thoroughly coat the veg in the dressing and serve.